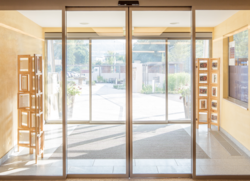 Our range of products include swing doors systems, automated sliding glass door systems, revolving door system, automated folding glass door systems, automatic sliding door system and wooden sliding doors system. It is a universal drive system for the automation of swing doors. It is characterized by sophisticated technology, compact design and SIO’s legendary smoothness of operation. Focus on a broad range of applications makes it a full-fledged drive, suitable for widely differing requirements. For environments with people of limited / slow reactions. For emergency evacuation of exit in case of fire or power failure. The Reliable in the case of Fire. Can be used with various fire-protection profile systems. SIO Automated Sliding Glass Doors have been designed to meet the requirements of light and medium-heavy sliding door applications. 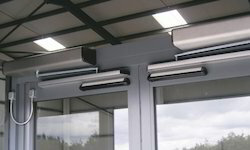 They are available in standard single and twin leaf sliding models, in classic or telescopic versions. The 32-bit microprocessor control enables a wide variety of operational modes and functions. The mode of operation is selected intuitively using the convenient and user-friendly BDE-D electronic remote control. The display features text in the language of your choice. It can be used to set or modify application-specific door parameters such as opening and closing speeds, opening widths for reduced opening, duration of open times, etc. Alternatively, parameter setting can also be done mechanically using the robust, key-operated switch. 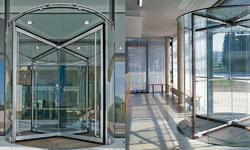 SIO Revolving Doors System is technically refined and noiseless in operation. Equipped with two, three or four leaves, with or without a display case and night-shutter, they are available in sizes up to 7500 mm in diameter. Virtually any combination of features is possible. 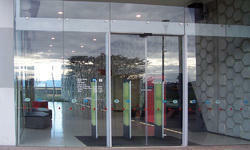 Our very wide range of design options gives planners and architects maximum flexibility in designing their entrances. The drive is fitted into the ceiling or invisibly under the floor, in any RAL color or anodized finish, or all glass model, which has especially transparent aesthetics. 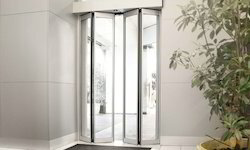 To enable easy access to wheelchair users and walking disabled, SIO revolving doors can be fitted with a switchable control to reduce the speed. Also exemplary is the high level of safety. All doors can be used as emergency escape routes, and work as additional escape support. If there is only limited space for door leaves to open in the passage area, which excludes the use of sliding doors, an SIO automated folding door provides a good solution. The width of passage can be almost fully retained. SIO automated folding doors can be retrofitted relatively easily and are designed to work particularly well when fitted in corridors. Depending on the total width available, the folding door is built as one- or two-sided. SIO Automated Folding Doors are ideal for narrow passageways in restaurants, hotels, business headquarters, hospitals and elderly people’s homes. Aluminium frame and cover available with all anodized and paint colors. The electronic remote control unit with back-lit graphic display enables easy setting of individual parameters (speed, hold open time etc. ), and other additional functions. The 32-bit microprocessor control enables a wide variety of operational modes and functions. The mode of operation is selected intuitively using the convenient and user-friendly BDE-D electronic remote control; the display features text in the language of your choice. It can be used to set or modify application-specific door parameters such as opening and closing speeds, opening widths for reduced opening, duration of open times, etc. Alternatively, parameter setting can also be done mechanically using the robust, key-operated switch. We are a reputed firm engaged in the provision of Wooden Sliding Doors System, which is known for its ease of installation and maintenance. 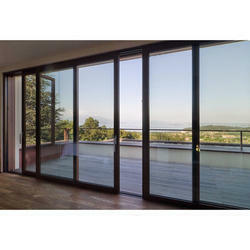 We are manufacturing Sliding Door System that is used in both residential and commercial places. The offered sliding door is manufactured using quality has proven raw material and the latest technology in adherence to industry standards. We are offering Wood Linear Door Systems to our clients. The kit consists of top track profile, hanger brackets, stopper, bottom guide. Ideal for wardrobes, home, and office partitions. 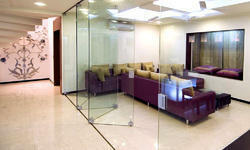 A heavy-duty sliding, folding system of frameless glass panels for Interior Applications. The Panels are joined together using folding glass SS hinges complete with hangers running on aluminum track. The hangers have bearings that are smooth running and maintenance free. A guide channel on the floor is required. The folding glass wall is secured at the bottom by using a foot-operated bolt. This glass wall can be locked on the last panel. 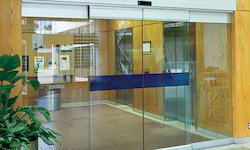 We are engaged in offering a wide assortment of Modular Glass Door. The offered door is made using supreme quality glass material and modern technology under the strict guidance of dexterous professionals at our well-equipped production unit. 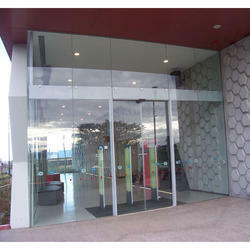 We are offering Synchro Bi-Parting Doors System to our clients. Designed to meet the highest demands in clinical technology, the Medi-seal range of hermetically sealing sliding doors represents over five years of extensive development and field testing. To maintain sterility and the correct air pressure in the department, the door into and out of the operating room should be a hermetically sealing, and sliding door. All MGI doors are constructed from a high-density particleboard core, and the high-pressure laminate is used to face both sides. The door blades are set firmly in an aluminum frame, containing a non-porous non-shedding door seal, which will allow the door to seal on all four edges in the closed position. The door track is constructed from an aluminum extrusion, fixed firmly to the wall. All MGI doors run on nylon wheels within the track. The track and wheel design are such that during the last 50mm of travel on the closing cycle, the door moves in 3 directions to form a seal against the floor, at the bottom and against the frame on both sides and at the top. Available in a wide range of attractive, compact laminate finishes, or optional stainless steel facing. The Medi-seal is supplied with a manual operation unit as standard. Optional continuous electrical or pneumatic operation is available, enabling automatic operation and programmable computer control through a variety of touch or hands-free interfaces. The standard automation unit incorporates interfaces, for connection to the building security, fire control or building management system.